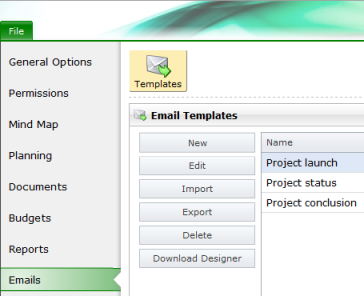 With the InLoox PM 7 email templates, you can insert pre-defined and project-based information into a new Outlook item. You can modify the InLoox PM 7 Web App email templates to fit your needs in the option section. This feature is only available for the InLoox PM 7 Universal User. Open the InLoox PM 7 Web App options. For more information on how to open the InLoox PM 7 Web App options, please go to Open the InLoox PM options. Click on Emails in the navigation pane on the left. The Email template setting area will open to the right. Define rules for the Outlook email parameters such as Recipient, CC Recipient, BCC Recipient and Subject. Click on Field and select an entry from the drop-down list, e.g. Project manager. Click on Delete rule in the drop-down list to reset the rules. In the Email Template dialog box enter a new Template Name. Define rules for the Outlook email items Recipient, CC Recipient, BCC Recipient and Subject. Click on Fields to select an entry from the drop-down list. Load a template from your local data. Click on Import and enter a new Template name. Click on Browse... and select a template in the Upload file dialog box, then select Open. Save a template to your local file storage. Select Open with or Save file in the Open dialog box. To open the template on your local file storage, go to the Download section. Remove a template permanently from InLoox PM 7 Web App. Choose a template from the list and click Delete. Customize the template content for a report with the InLoox PM 7 Web App email designer. Choose a template from the list and click on Download Designer. Adjust the InLoox PM Report Designer settings in the dialog box. For instructions on how to work with the InLoox PM 7 Web App report designer, go to Work with the report designer and the help documentation of the designer. Select Save & Close in the navigation pane to save the changes. The Outlook integrated client is automatically synched according to the changes you make in InLoox PM 7 Web App. To find out more on how to use the email templates in InLoox PM 7 for Outlook, go to Customize email templates in InLoox PM 7 for Outlook. Customize email templates in InLoox PM 7 Web App • Copyright 1999-2019 © InLoox GmbH. Tutti i diritti riservati.